Easier said than done right? Maybe. But with a bit of forethought and conscious thinking, its possible to create time for yourself and take a break from being a wife, mother, sister, daughter, employee and boss. By incorporating some of these practices into your daily life you will be creating more meaningful me-time. Download your own 5 step reminder here. Don’t let life happen to you. Take matters into your own hands. Unhappiness and discontentment will surely be yours if you’re reactive and don’t take charge of what your time is doing for you. Those deeply unsatisfying episodes of looking back, wondering where the time went and feeling no closer to where you want to go can be banished by planning ahead. Thinking through what you want and stating it clearly means you’ll inevitably start taking steps to achieve that thing. Only dead fish go with the flow. Stop comparing yourself to everybody else! Everybody is on a very different journey to you. The decisions that another person is making are the sum of their upbringing, education and experiences so don’t go basing what you want on someone else’s desires. It’s easy to get caught up in feeling that there is certain things you must have, must be and must do. But what you should be listening to is your own soul - it’s the only one that’s going to be around throughout your whole life long after people move on and away. There’s nothing that you must achieve or do and no set way of going about things but if you block out the interference and listen to your soul you will learn how you need to be. Run, rockclimb, barre extend, chase the kids – do whatever you have to do to sweat everyday. Ok, in our Asian countries that can mean just walking outside but that counts too. It doesn’t mater how you perspire, the important thing is to move your body daily. Why? Because it gives your head a break and you get a natural high in the process. A lot of us spend so much time doing cranial somersaults, working out problems, keeping our thoughts and emotions and fantasies locked away in grey matter that we become disconnected from our bodies and feel like we might explode. You need to release the pressure! You are going to punish yourself. No doubt about it. Whether you choose to work, not work, forgo organic everything, skip a school performance, go out for a pedi, introduce your daughter to pedi’s at an age you think she’s too young to be worrying about the nonsense of beauty just so you can enjoy your pedi in peace, you’re going to berate yourself for your choices. But remember this: guilt and worry are wasted time. You made the best decision on the day and that’s all any of us can ever do. Punishing yourself afterwards makes you miserable and doesn’t achieve anything. You’re better off putting that energy into creating something of value and worthy of delivering a smile. It’s easy to celebrate the major milestones, the big victories: a new job, a birthday, a birthday cake shaped like a firetruck that you managed to pull off. Much harder it is to spot the daily and weekly achievements: lots of happy chat around the dinner table, running 1km further than normal, running around after kids and getting to their ECA’s on time. Parenting, partnerships and professional life are rewarding but relentless. If you don’t take a moment to enjoy a glass of bubbles and pat yourself on the back regularly, it’s hard to keep going back for more. You’re doing great getting through this life. Give yourself a break and a chance to enjoy it. We all know we are supposed to live life to the fullest, but it's not easy figuring out how to do it without using up all your money or doing something irresponsible. So, at Take time to BE YOU, we've been doing a lot of thinking, trying to find ways to make each day more meaningful and memorable. And now, we think we've found a way. It's easy, and free! All you've got to do is put a few minutes aside each day to ask yourself the following five questions. (Asking yourself these questions at night will help you reflect on the day and decide how you want to go about doing things the next day. Or you can use these as statements of intention each morning to give you some purpose and direction for the day ahead). Download your very own make it count post-it reminder note here. Because laughing is the best medicine to help you feel better. It allows you to unwind, de-stress and it gives you an energy boost. Because when you learn, you grow and develop as a person. Knowledge is Power after all! And as Dr Seuss says: “The more that you read, the more things you will know. The more that you learn, the more places you'll go". Listen. Really listen! Put yourself in other people's shoes. This will give you perspective when thinking about your own life and allow you to understand and connect better with the people around you. It can make you happier and help you manage stress. Here, when we talk about love, we mean allowing yourself to really feel and show your feelings. Tell the people you love that you love them, don't just assume they know. Saying I love you can be hard but it’s good for you! (there is research to prove it!). And last but not least, look after yourself both physically and emotionally. Exercise. Eat well and remember to be nice to yourself. Be your own best friend! (You can visit our get fit page for tips and ideas on how to do it). We hope this helps you. And don't worry if you forget to do it sometimes, you'll probably remember on the days it really matters. What's important is that each time you do this exercise you let yourself go and fully benefit from the experience. * This combination of words is popular, many have used them to come up with life lessons, design a leadership principle, a road to happiness, and a lot more. Here at Take time to BE YOU we have used them as a way to check in with ourselves and ensure we are living life to the fullest. Give this a try and let us know how you get on. Take time to BE YOU is here to help you live a more authentic and meaningful life. If you know of any mummies who feel like they've lost themselves and are struggling to be who they really want to be and do what really matters - please tell them about Take time to BE YOU. Pass on our details and let them know they are not alone. We are here to help. 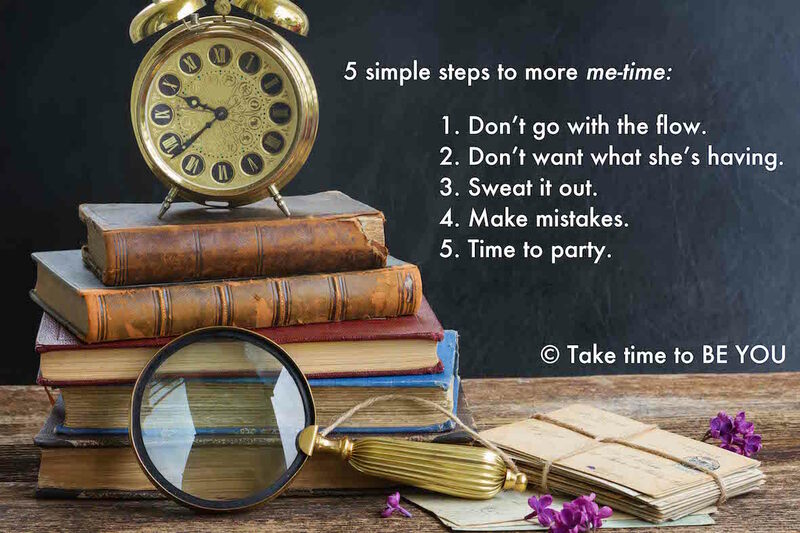 • 5 easy steps to more me-time. 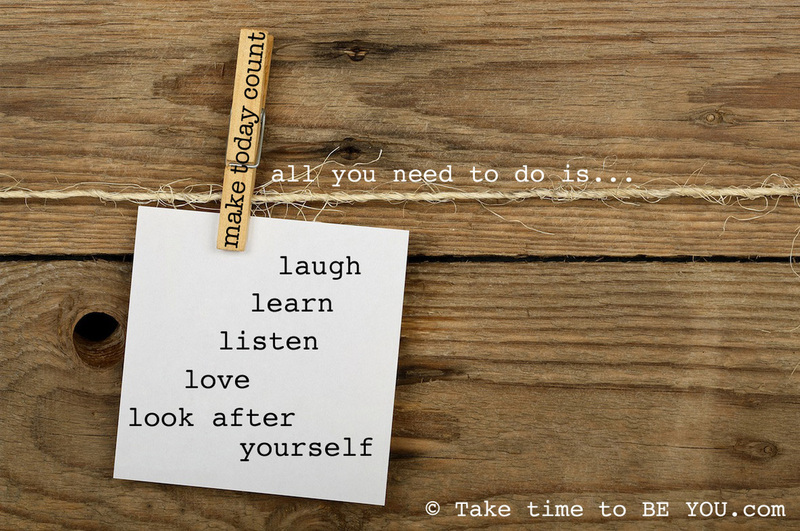 • How to make today count.